Australian researchers have also recently reported on how this parasite alters our sexual behaviors as well. Oooh, toxo, one of my favourites! And palintomy is a really cool form of cell division... love stained micrographs of that! this is very interesting but it begs the question why don't doctor's screen for it so that you can be treated then? 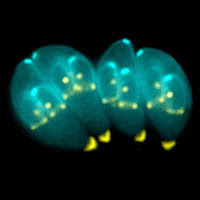 For most people, being infected with Toxoplasma is asymptomatic, so screening is usually only done for pregnant women or immunocompromised people. Treatments are not simple things and have many side effects. See this page from the Mayo Clinic for more info on treatments.